The Russian government intends to sell part of its shares in large raw material companies in 2016. The buyers can be foreign investors, with certain conditions. 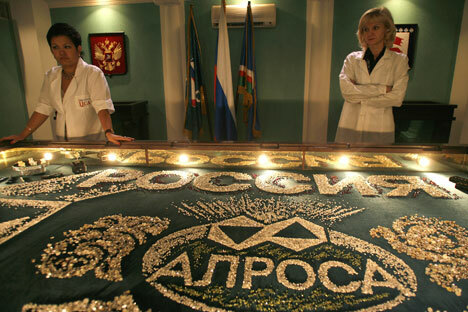 Shares of Russia's largest diamond mining company, Alrosa, will be sold through the Moscow Stock Exchange. The Russian government said at the beginning of this year that it had "a large privatization plan”, within the framework of which it intends to get one trillion rubles ($12.6 billion) in two years. The plan for 2016 includes the sale of shares in two oil companies, Rosneft and Bashneft, a share package in one of the largest state banks, BTV, and the Alrosa diamond company. At the end of April 2016, the privatization format of the list's first company was determined. The government decided to sell 10.9 percent of Alrosa, Russia's largest diamond mining company, in the Moscow Stock Exchange, writes the Vedomosti newspaper. The schedule for the sale is not specified. Earlier, the government considered selling the package to a strategic partner. However, the company itself requested public privatization. "The sale of the shares on the stock exchange will help us receive a higher evaluation and attract a large circle of interested investors," explained Maxim Chernyaev, chief economist at Novas Energy Services, an oil service company. According to a Vedomosti source, the government expects to earn more than 50 billion rubles ($754 million) from the sale. The fate of Rosneft and Bashneft will also be decided soon. As Minister of Economic Development Alexei Ulyukaev said earlier, 19.5 percent of Rosneft's shares may be sold, in parts. The government expects to get 650 billion rubles ($9.7 billion) from this deal, he said. Those wishing to buy shares in the oil companies have expressed their interest. Potential buyers of Rosneft and Bashneft shares have already begun talks with the Russian government, said Deputy Prime Minister Igor Shuvalov at a press conference on April 25. It became known on April 21 that the Chinese National Petroleum Corporation (CNPC) may participate in the privatization of Rosneft. The possible shares that CNPC may purchase will be discussed between the heads of the Russian and Chinese governments. About Bashneft shares, only Russian investors, including Lukoil, Russia's second largest oil company in production volumes, have shown interest so far. Bashneft became state property in 2014. Before that, 71.6 percent of the shares belonged to Sistema, a large Russian holding company, and its subsidiaries. "The company's shares are undervalued. Looking at Bashneft's main financial indicators in the last three years, you can conclude that it is attractive for investment," says Chernyaev. Bloomberg estimates Bashneft's capitalization at $6.47 billion. Chernyaev believes that not only Chinese investors are interested in the privatization of Russian state companies. "Probably our European and trans-Atlantic partners are also considering the possible ways of purchasing shares in Alrosa, Rosneft and Bashneft." He said the privatization will most likely go through affiliate participants, so European investors would be able to purchase the shares through mediators. According to Maxim Shein, head of the investment department at BKS, foreign investors will be able to participate in the privatization on condition that they register their subsidiary in Russia. This is an essential part of the privatization rules introduced by Russian President Vladimir Putin on February 1, 2016. In accordance with these conditions, share purchasers must be under Russian jurisdiction and the shares must be bought either with one's own money or with credit received from non-state banks. The most important condition however, is that control over the strategic enterprises must remain with the Russian state.